Wyoming Farm Bureau Federation Executive Vice President Ken Hamilton, right, received the WyFB Distinguished Service Award from WyFB President Todd Fornstrom, left, at the organization’s 99th annual meeting. Hamilton was joined by his son Ian Hamilton and wife Kathy Hamilton. 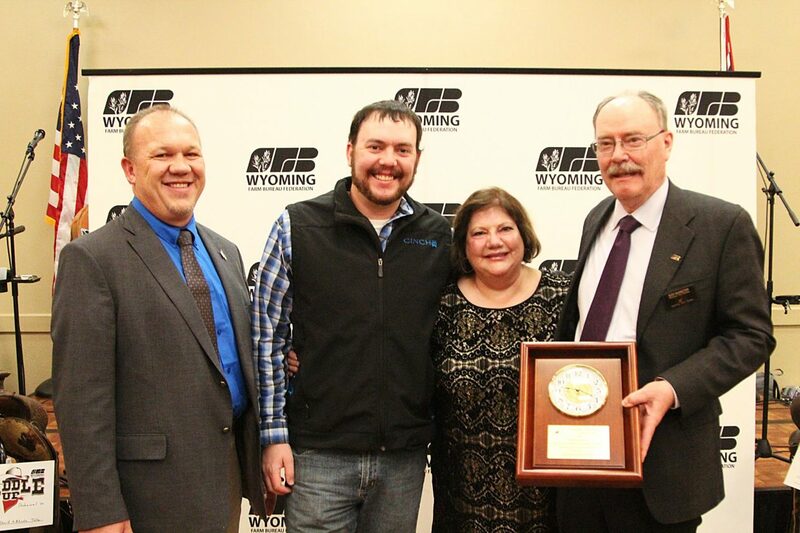 Wyoming Farm Bureau Federation Executive Vice President Ken Hamilton was awarded the Wyoming Farm Bureau Federation Distinguished Service Award at the 99th annual meeting of the organization. Presented Nov. 8, the award is given to those who have gone above and beyond in their service to agriculture. Hamilton joined the Wyoming Farm Bureau Federation staff 35 years ago as field staff and research assistant. He then served as the director of field services and later became the administrative assistant. In 2004, he was named the executive vice president of the Wyoming Farm Bureau Federation. Growing up on a ranch and talking with family about politics and their impact on agriculture has led Hamilton to a lifetime of Farm Bureau leadership for Wyoming farmers and ranchers. According to Hamilton, he was always aware of policy discussions growing up, but notes there is a difference in having an opinion and taking the next step of carrying out policy discussions. Advocating for and leading discussions on agriculture policy issues is how Hamilton makes a difference for Wyoming farmers and ranchers. He believes strongly in Farm Bureau’s policy development process because it allows for input from a diverse group of agriculture folks. The spirited discussions at every level on resolutions ensure the policy is well vetted. When a majority opinion is reached a good foundation has been established to communicate the needs of farmers and ranchers. Policy and people drive his passion for the work of Farm Bureau. Hamilton noted it is the people he works for and with that are the heart and soul of the organization. “The relationships you have with farmers and ranchers in the counties is so valuable,” he said. 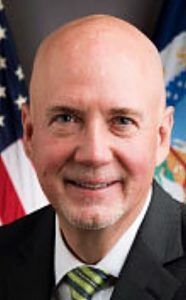 “There have been a lot of really good leaders over the years and there continues to be good leaders with which we get to work.” Legislators call on him for an understanding of agriculture issues as his broad base of education, experience and interest have proven to be a strong resource. Sheep, cattle, hay, federal lands grazing and irrigation were all a part of Ken’s upbringing. Ken grew up on the Hamilton Ranch near Hyattville with his parents, Eleanor and the late Merle Hamilton, and brother Keith. The Hamilton Ranch was recognized in 2015 as a Wyoming Centennial Ranch and is run by Keith and Linda Hamilton and family. Ken and his wife, Kathy, just celebrated their 37th wedding anniversary. Kathy is a certified public accountant. They have one son, Ian.